Thanks to unprecedented amounts of startling generosity, I am here pleased to present the opening sections and first chapter of the new expanded edition of Making is Connecting. You can download the PDF right here. 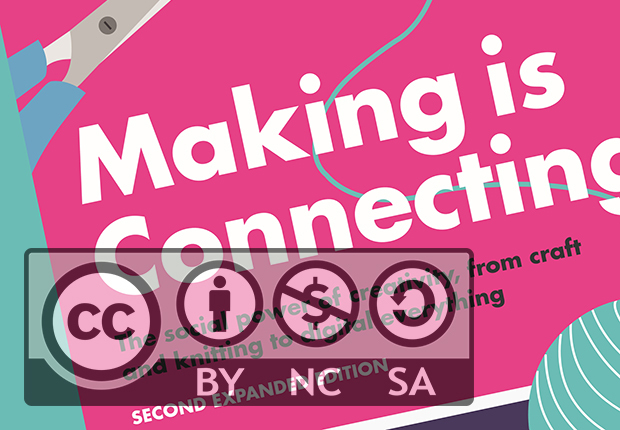 The book begins with a ‘Preamble to the second edition’, which begins: ‘Hello, and welcome, or welcome back, to Making is Connecting‘. It goes on to explain that times seem to have changed since the first edition. ‘”Making is connecting” is a timeless proposition’, it says, ‘and should be a pretty time-proof book, but, you know, things happen, and the context changes even when the essence of creativity remains the same’. The discussion proceeds through sections entitled ‘New gloom’, ‘So is the internet all bad now?’ and ‘Internet = world’, before a helpful bit explaining what’s new in the new book. This is followed by the first chapter, unsurprisingly called ‘Introduction’, which sets out the book’s core argument, and why I wanted to write it. I do hope that people who liked the first edition will want to get the second one, and it was with them in mind, in particular, that I revised the whole thing and added three whole new chapters, so that it’s a worthwhile improvement and you get a decent amount of all-new stuff. To see how it begins, download the PDF.